On 17th June MOL (Mitsui O.S.K. 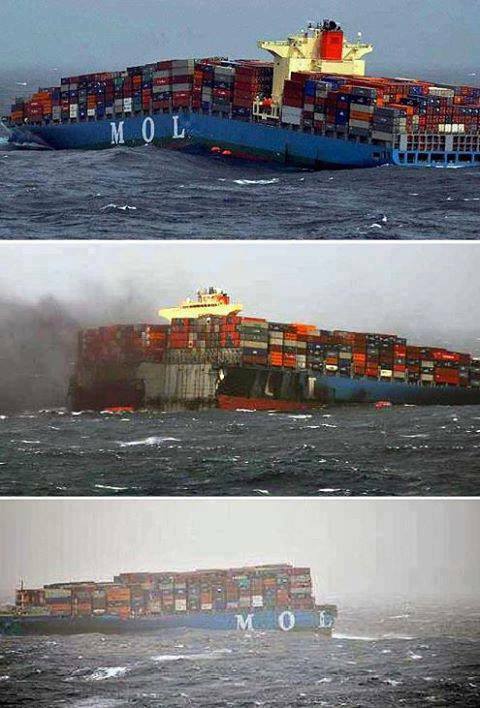 Lines) Comfort cracked mid-ship and broke into two pieces while carrying 4832 containers from Singapore to Jeddah. The incident occurred 230 miles off the coast of Somalia in a swell of 5-8 m. The ship was built by MHI at Nagasaki and completed in July 2008. It operated as APL (America President Lines) Russia until 1st June 2012. As of 23rd June most of containers are still aboard, and tugs are on route to try to salvage the two sections and remaining cargo. MOL Comfort is a large post-panamax container ship, one of 12 ships built of similar design, which were the first classified by Nippon Kaiji Kyokai to utilise high strength steel with yield point of 470 MPa in the hull structure. As pointed out at gcaptain.com http://gcaptain.com/comfort-container-weight-issue/, the MOL Comfort was built at a top quality shipyard and operated by a tip-top liner company. The things that come to mind immediately are 1) Weather 2) Welding quality 3) Pirates?, gcaptain suggests tehre may also be an effect from the undeclared weight of containers. This is an interesting problem, since surely the total weight of the ship is easy to measure by measuring the displacement in dock? Also easy to weigh each container as the loading cranes can easily be fitted with equipment to weigh the loads (they need this anyway to ensure safety of the crane). It seems common practice to misreport container weights during loading, but are these weight then used to decide the position of the containers on board? Containers need to be placed, and moved, in such a way as to minimise the forces on the hull at all times. This incident is of great concern and we want to know the cause of this structural failure. 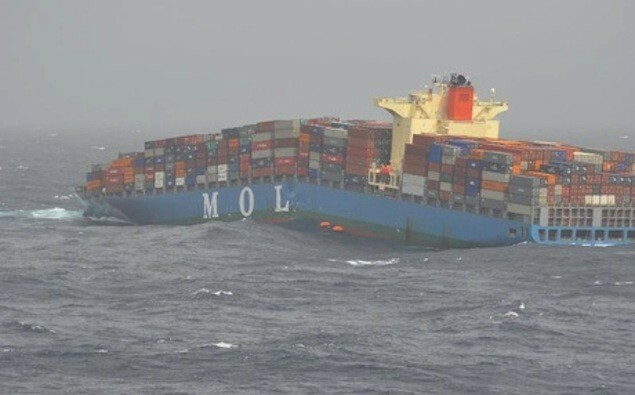 Ths ships builders MHI have set up a task force to work with MOL to investigate the source of the failure. As of 24 June the two halves are still floating and can be found drifting near 15”12N 66’53”E and 13’38”N 64’10”E. Original location was 12’30″N 60’E. As of 25 June two MHI engineers are in place on one of the tugs sent to salvage the container ship, to investigate the cause(s). There are no statements from the crew, who may also be able to shed light on the incident. The aft part of the ship eventually sunk with the containers at at 16:48 JST (11:48 Dubai time) on June 27. The fore part is being towed towards the Arabian Gulf. Although the ships are built following international standards, the sister ships will subsequently be strengthened to at least twice the standard strength. Fan, Yang, Lin, Fan and Liu report on use of ultrasonic waves to assist GMAW welding. Ultrasonic vibration adds an additional force which is able to help control droplet size in welding. Above is shown their pictures for water and weld metal, high speed camera was used with frame eate of 150 frames per second (Hz) and ultrasonic frequency imposed was 20 kHz with amplitude of 30 μm. On youtube (http://www.youtube.com/watch?v=uENITui5_jU brusspup has produced a video demonstrating some optical illusions which can be produced when combining video camera and vibration on flowing water. In bowls and large containers the perturbations on the surface caused by vibrating the container are named after Michael Faraday who published a paper describing the effect in 1831 (Philosophical Transactions of the Royal Society (London), vol. 121, pages 299–318.). Faraday waves/ripples are described in the appendix M. Faraday, On the forms and states assumed by fluids in contact with vibrating elastic surfaces. I think this should be the same phenomenon when ultrasonically vibrating the weld pool, although it may be worthy of a different name I am not aware of. Applying vibration to the liquid can produce a surface instability which can form complex patterns and standing waves. It seems reasonable that applying a vibration will have an effect on droplet size and perhaps allow more reproducible welding results. In their paper Fan et al measured increased frequency of metal transfer (smaller droplet size) at all feed rates when using ultrasonically assisted GMAW. The ultrasonic vibration also adjusted the shape of the droplet, elongating it along the welding axis. 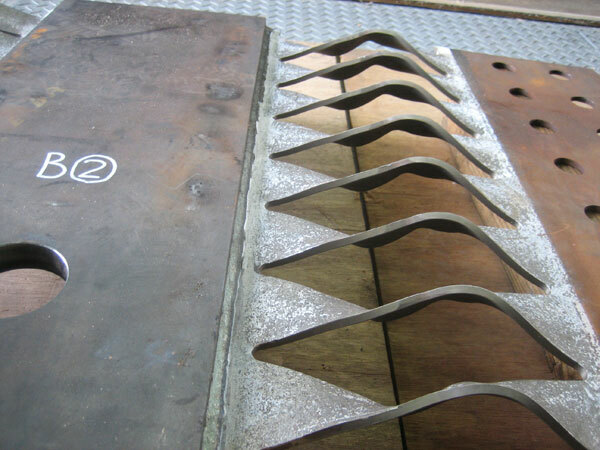 Further work will assess the welds formed by this process, and also effect of acoustic environment for process control. This might be a good way to remember the difference between effect and affect. HAZ is common abbreviation for the ‘Heat Affected Zone’, the volume of the base material altered by heat from welding process. I decided if a ‘Heat Effected Zone’ exists it should be the new volume created by the welding process, i.e. the weld pool or fusion line. Scientists in Stanford university and others have developed earthquake resistant steel frames in which yielding of steel is used to dissipate the energy of the earth quake. The steel frame structure contains replaceable cut steel plate ‘fuses’ which deform during the earthquake, and can be replaced easily afterwards. This is a picture to show what can happen when a weld fails in a pressure vessel. The picture is from ‘The efficient use of steam’ by P. M. Goodall. Welds are often the source of failure in structures because the welding process has the possibility of introducing many different defects. In welding a localised area of material is heated and this necessarily leads to temperature gradients. This can cause large differences in the microstructure in the area of the weld. 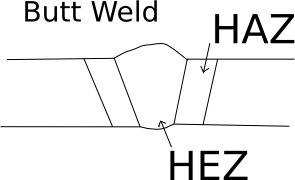 Even when a good weld is possible it may not be simple to make the weld reproducibly due to differences in geometry of the structure and welding position (overhead, horizontal, sideways, etc. ).